Canada boasts some of the world's most beautiful landscapes and offers gorgeous locations and interesting cities to visit while on a road trip. The country's raw natural beauty is often overlooked, but is just perfect to discover with a Canada RV rental. Join me for this special blog series as we discover some of the spectacular places to visit in the Great White North. First up is a Quebec Motorhome Roadtrip along Route 138. The drive from Montreal to Quebec City is about 253km or 157 miles. The biggest town on this part of the journey is Trois-Rivières, a great place to stop and discover some historic structures as well as the Quebec Museum of Folk Culture, which is a great introduction to the social history of the province. Just outside the town, if a little off the beaten track is Les Forges du Saint-Maurice, a historic site that honors the 18th century ironworks that were the backbone of the province's industrial revolution. When you reach Quebec City you will be met by a city steeped in history and beauty. The historic center was established in 1608 and the city is chalk full of the influences of the past. Check out Hauteville (Upper Town), which is still walled with ramparts, and the architecture and European-inspired energy in the city. Quebec City also has great choices for restaurants, museums and galleries. If you prefer to park your RV and explore on foot Quebec City has much to offer--from its narrow, winding streets to Battlefields Park, the site of the historic Battle of the Plains of Abraham. Once you've had your fill of Quebec City hit the road again and head for Tadoussac, which is about two-and-a-half hours away. A fun treat a bit south east of Quebec City is the Ile d’Orléans, an original outpost of the French in the region during the 17th century. Not only can you enjoy the island's old fashioned feel, but you can admire its churches and red-roofed houses. In the summer you can also pick your own fresh, delicious strawberries and in the autumn you can pick apples to take with you as you head to your next destination back on the maindland. As you continue driving you may want to pause in Ste-Anne-de-Beaupré to witness its beautiful cathedral, which looms high over the water below. Between Quebec City and Tadoussac the road moves away from the river until you find yourself driving through the beautiful hills of the Charlevoix region. This area is especially beautiful as leaves change color in the fall. 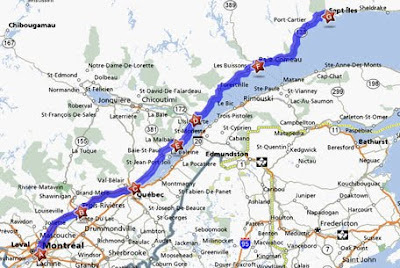 Eventually Highway 138 continues east past La Malbaie, across the Fjord du Saguenay to Tadoussac. In the area of Tadoussac and Bergeronnes the former is the main tourist city. The scenically stunning region, including the Fjord, boasts many opportunities for kayaking, canoeing and whale watching tours. If you would like to further explore the Fjord head north from Tadoussac, taking Highway 172. Tadoussac is 198km or 123 miles from the next main city along the road, Baie-Comeau. Some lucky drivers have even reported seeing a whale during their drive! The town of Baie-Comeau is named after the Canadian naturalist Napoléon-Alexandre Comeau and is also the birthplace of former Prime Minister Brian Mulroney. A few kilometers outside the town is the Centre de Ski du Mont-Tibasse, which offers both downhill and cross country skiing. A little east is the riverside town of Godbout, where a great museum of Aborigional culture can be found that features an extensive art collection. You can also visit Sept-Iles (Seven Islands), the northernmost city in the province, which also has a museum dedicated to the original occupants of the area, the Innu Nation. Making the drive along Route 138 in Quebec offers the opportunity to choose between a multitude of cities to visit and small detours to take. Discover villages filled with history and culture, participate in sports and whale watching, and enjoy the stunning scenery along the way. If you are interested in making the drive in comfort then find great Quebec RV Rentals at MotorHomeandRVTravel.com. Check back for my next post to learn all about another unforgettable Canadian roadtrip route.